Mondays should be depressing. The memory of a fun weekend still fresh in the mind, returning to all the problems left behind on Friday and the endless expanse of time until next weekend. Surely Mondays are the most depressing day of the week? New research, though, suggests Mondays aren’t as bad as we think. Unfortunately it also finds that Fridays and Saturdays aren’t as good as we imagine either. People thought their worst moods were experienced on Monday mornings and evenings. 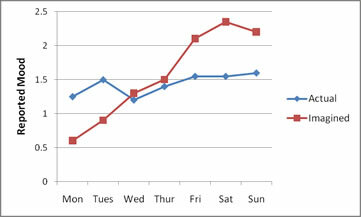 People thought their best moods were experienced on Friday and Saturday mornings and evenings. Fortunately Areni and Burger didn’t believe these reports were accurate so they decided to test a further 351 people’s moods in the moment by asking them how they were feeling each day, on that day. They found that, on average, people’s mood remained about the same throughout the week. Mondays weren’t as depressing as people thought and Fridays and Saturdays weren’t as exciting as people predicted. The results demonstrate the memory bias: when thinking back we tend to recall the worst incidence of an event we’ve experienced before. Mondays are stereotypically depressing, so we tend to recall the worst Mondays. Fridays and Saturdays are stereotypically exciting so we tend to recall the best Fridays and Saturdays. Consequently, in reality our mood fluctuation over the week might not follow the stereotypical pattern of a steady increase from a low on Monday through to a high on Saturday. Instead our weekly average mood profile could be much flatter than we imagine.